Due to the large number of houses going into decay we have turned off the Housing Warehouse until we can look into this issue further. We will keep everyone informed as to when it will be turned back on as soon as possible. Due to the holiday tomorrow we will not return to the office until Tuesday. Starting this afternoon, the Japanese shards will get Publish 88 during their normal maintenance cycle. Please remember that this causes problems with character transfers until we have all the shards on the same server version. On behalf of myself, and the UO Team, we would like to wish everyone a Happy Thanksgiving. The office will be closed (except for GM coverage) on November 27th and 28th. The Huntmaster at the Skara Brae Ranger’s Guild now offers a monthly challenge for hunting various species throughout Britannia. • Visit the Huntmaster NPC at the Ranger’s Guild outside Skara Brae to obtain a hunting permit via the Huntmaster’s context menu. • Permits cost 5,000gp, the funds must be available in the player’s bank box. • Double click on the hunting permit and target the corpse of a valid species to record the kill. • The Permit will display the Hunter’s Name, Date of the Kill, Location of the Kill, Species of the Kill, and a measurement for the Kill. • Taxidermy Kits can be used on the hunting permit to create a trophy for display. • Return to the Huntmaster to submit a kill for consideration in the monthly competition. • If a submission has the greatest wormeasurement for a species, the kill will be displayed on the trophy inside the Ranger’s Guild. • If a submission ties the greatest measurement for a species the display on the trophy will not update, however the submitting player will be eligible for reward when the contest concludes each month. • If a submitted kill has the greatest measurement at the end of the month, the submitting player(s) will get points for each submission to redeem rewards from the Huntmaster. • Kills can only be submitted from the current month and year. • The Huntmaster’s month will be updated on server maintenance, each new month the contest will reset. Leaderboards have been added to VvV. A new house plant has been added to the Cornucopia. • The house plant must be locked down to grow. • The house plant will grow each day on server up. • Once the house plant has reached its full growth state, it will produce fruit. • Fruit can be harvested from the house plant by double clicking on it. • House plants are maintenance free. • New green, blue, or gold fireplace. o Fireplaces can be ignited and doused by double clicking on the center piece. • A grinder that can be used to grind various plant products. • A steam powered beverage maker that can be used in conjunction with the cooking system to create new items listed in the “Beverage” section of the cooking menu. o The powerscroll book can hold 300 power scroll, no more of 99 than any specific scroll. o The book be must locked down in a house in order to add scrolls. o Stat power scrolls cannot be added to the book. • The Sewing Machine & Smithing Press are house-addons that can be used in conjunction with the tailoring and blacksmithy skill, respectively. • The machines will hold 5000 charges of their respective tools. • Add charges to the Sewing Machine by dropping sewing kits on the stool. • Add charges to the Blacksmith Press by dropping smith’s hammers, sledge hammers, or tongs on the crates. • Runic, Ancient, or specialty crafting tools cannot be added to the power tools. • Security can be set on the power tool to limit who can use and deposit tools into the attached stool or crates. • The crystal portal will now teleport players to the Trinsic Royal Bank instead of the Bank of Britannia: Trinsic Branch. • Magic items generated from treasure chests have had their base budgets increased based on the difficulty of the treasure chest. • The following items are now stackable: Grass & Snow Tiles, Dread Horn. • Trade Crates will now accept 1000 stones. • Lifestealers now have the correct karma. • Delivering trade orders will no longer increase karma if it is locked. • Treasures of Doom has been reactivated and extended until server up on 12/6/2014. • During Governor elections “Governor, “ will be prepended to the name of the incumbent on the various voting gumps. • Minor pigments can now be combined up to 50 charges. • Fireplaces now function as a fire source for cooking. • Hunting Permits can no longer be used on living animals. • Unused tiles inadvertently created by hunting permits will be deleted on server up. • VvV Score Points have been reduced by a factor of 100 to accommodate their values in the Leaderboard gump. • VvV Score points will be awarded on a 1:1 basis for guilds that win or tie the max points in a VvV battle. • VvV Score points will be awarded on a 0.5:1 basis for guilds that do not win or tie the max points in a VvV battle. We are publishing to TC1 this afternoon. We will be publishing this out to Origin and Izumo on Monday, 17th. Publish 88 will go World Wide on the 20th. Please make sure you check out all the new content and give us your feedback. Visit the Huntmaster NPC at the Ranger’s Guild outside Skara Brae to obtain a hunting permit via the Huntmaster’s context menu. Permits cost 5,000gp, the funds must be available in the player’s bank box. Double click on the hunting permit and target the corpse of a valid species to record the kill. The Permit will display the Hunter’s Name, Date of the Kill, Location of the Kill, Species of the Kill, and a measurement for the Kill. Taxidermy Kits can be used on the hunting permit to create a trophy for display. Return to the Huntmaster to submit a kill for consideration in the monthly competition. If a submission has the greatest measurement for a species, the kill will be displayed on the trophy inside the Ranger’s Guild. If a submission ties the greatest measurement for a species the display on the trophy will not update, however the submitting player will be eligible for reward when the contest concludes each month. If a submitted kill has the greatest measurement at the end of the month, the submitting player(s) will get points for each submission to redeem rewards from the Huntmaster. Kills can only be submitted from the current month and year. The Huntmaster’s month will be updated on server maintenance, each new month the contest will reset. Leaderboards have been added to VvV. Leaderboards are accessed from guild menu. A new house plant has been added to the Horn of Plenty. The house plant must be locked down to grow. The house plant will grow each day on server up. Once the house plant has reached its full growth state, it will produce fruit. Fruit can be harvested from the house plant by double clicking on it. House plants are maintenance free. New green, blue, or gold fireplace. Fireplaces can be ignited and doused by double clicking on the center piece. A grinder that can be used to grind various plant products. A steam powered beverage maker that can be used in conjunction with the cooking system to create new items listed in the “Beverage” section of the cooking menu. The powerscroll book can hold 300 power scroll, no more of 99 than any specific scroll. The scroll be must locked down in a house in order to add scrolls. Stat power scrolls cannot be added to the book. The Sewing Machine & Smithing Press are house-addons that can be used in conjunction with the tailoring and blacksmithy skill, respectively. The machines will hold 5000 charges of their respective tools. Add charges to the Sewing Machine by dropping sewing kits on the stool. Add charges to the Blacksmith Press by dropping smith’s hammers, sledge hammers, or tongs on the crates. Security can be set on the power tool to limit who can use and deposit tools into the attached stool or crates. The crystal portal will now teleport players to the Trinsic Royal Bank instead of the Bank of Britannia: Trinsic Branch. Magic items generated from treasure chests have had their base budgets increased based on the difficulty of the treasure chest. The following items are now stackable: Grass & Snow Tiles, Pristine Dread Horn. Trade Crates will now accept 1000 stones. Lifestealers now have the correct karma. Delivering trade orders will no longer increase karma if it is locked. VvV Sigil stolen stat is now tracking correctly. Fixed issue with Runic Reforging budgets being incorrect. Opening bank box for the first time no longer defaults to list view. Fixed issue where vendor search gump would not function. Fixed issue when a player’s primary target is more than 10 tiles away from the player many of their hotbar icons become un-usable. We will be publishing all shards starting tomorrow morning, all shards will receive Publish 87 during your normal maintenance cycles, European shards will get this tomorrow afternoon during their normal maintenance cycles. Since we have been so late this year with Halloween and Anniversary rewards we have turned them back on. 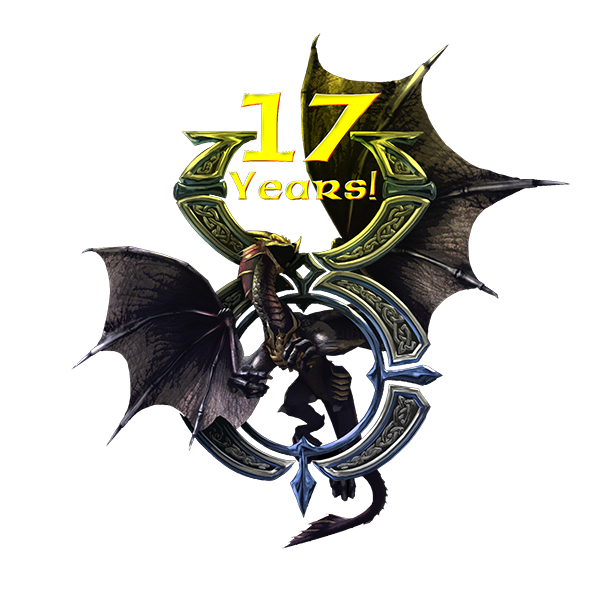 The 17th Anniversary Gifts will be turned back on and can be claimed until November 18, at 11:59 pm. Halloween Trick or Treating will be available until server up on November 19, 2014. Treasures of Doom will continue until server up on December 1, 2014. Enjoy everyone!!! Visit the Research Camp located outside of the Dungeon Doom in Malas to learn about an archeological investigation. You can also resurrect at the camp. Slaying monsters inside Dungeon Doom gives a chance for an Artifact of Doom to drop in the players backpack. Luck and creature difficulty will positively influence the chance at receiving an artifact of doom, being hidden will decrease the chance at receiving an artifact of doom. Tincture of Silver – can be applied to weapons, spellbooks, and certain instruments to give a slayer bonus against creatures within Doom, while becoming vulnerable to undead. Requires ancient parchments (10), wood pulp (10), antique documents kit (1), and beeswax (5). Failure will only consume ancient parchments, wood pulp, and beeswax. There are 5 different prophetic manuscript texts, randomly assigned when successfully crafted. Treasures of Doom will be available for a limited time during the Halloween season, and recur with various tweaks in successive years. Three new monster skulls have been added to Trick or Treating! Trick or Treating will be available during the remainder of the month of October. All players who are currently flagged as Vice vs Virtue participants will have a one time reprieve and the flag will be removed. Non Vice vs Virtue players that find themselves in a VvV battle city will have a new option on the warning gump to teleport them to the nearest moongate. VvV participation flag for non-VvV players will now be removed after 8 hours, or the participant is killed by a VvV player, whichever comes first. The “Unwieldy” (Items with higher than normal weights) will no longer have a chance to spawn in MIB chests. The loot in MIB chests will now have a higher base budget for creating magic items. Some situations where traps and locks were being applied to containers inside of City & Justice regions will no longer happen. Trade Quest crates will now be able to hold up to 550 stones and have 75% weight reduction. Silver points are no longer awarded to VvV players when occupying a city. VvV Cannon Turret cost has been reduced from 5000 to 3000 silver points. VvV Trap cost has been reduced from 500 to 250 silver points. VvV Mana Spike cost has been reduced from 2500 to 1000 points. VvV Mana Spike effect duration has been increased from 20 to 60 seconds. Trader Quest participants will no longer be able to sacred journey to a ship rune. Items inside a trade order crate will no longer be purchased by shop keepers. Ship cargo containers will no longer be locked or trapped. The “Unwieldy” property will no longer spawn on items that can be stolen from various containers. Claiming an Alter and Returning a Sigil in VvV matches have been equalized. The cooldown between gaining VvV match and silver points from kills has been reduced from 5 minutes to 2 minutes. VvV Players who are hidden will not count towards occupying a city. I would like to take a few moments to announce the winners of the Backpack Art contest we had on Facebook recently. If these people will get in touch with me at [email protected] and set up a time and date for me to meet you in game I will turn the houses over to you. Please make sure you do not own a house on the account you are taking ownership of the house with. The Butchers are back! Visit graveyards throughout Britannia and slay the Butchers to have a chance at a Pumpkin Carving Kit. Carveable pumpkins can be harvested in fields across Britannia. Watch out for the Grimms as you try to harvest a pumpkin! VvV steeds can no longer be mounted while dead. Return to Britannia Campagin Starts Wednesday!! Whether these are your first steps into Britannia or you are a seasoned veteran, King Blackthorn is delighted to welcome you! You are encouraged to visit the cities of Britannia and explore the various goings on. City banks are a hub for trade and socialization. Be sure to listen to Town Criers for the latest News, or check the City Bulletin Boards for updates from the City Governor. We also invite you to visit the Guild Recruitment stations in the cities of New Haven and Luna Bank as many guilds are welcoming new members! While you are enjoying your visit to the lands of Britannia please check out the new Vice vs Virtue system. You can read more about this system and the other features of Publish 86 here. We have introduced Advisors in the world to help you with your questions and minor issues you might have in the game. When they are available you may contact an Advisor by opening your paperdoll and clicking on the help button, then select “Contact an Advisor” at the top. We have also been working with one of our talented players and created a sharp new UI for the Enhanced client. If it has been some time since you last visited Britannia, we have added new sea adventures with our High Seas expansion which includes smooth boat movement, so be sure to go for a sail during your visit! There are also new house add-ons available via the King’s Collection booster pack, now you too can live like a King! There are many new encounters and features to experience, you can catch up on all of our past patch notes here. If you are having trouble with getting acquainted with the game you can check out our Player’s Guide. If you are having trouble with the account management page or need help with changing out any credit card information we have video tutorials available to help you through the process of Updating Payment Information and Recovering Accounts. When you are ready to play simply download either the Enhanced or Classic clients. Thank You for playing Ultima Online! Long Live Britannia! Comments Off on Return to Britannia Campagin Starts Wednesday!! The goblet clanged hard against the stone wall, the messenger shrinking away from her wrath as she shouted. “DON’T BRING ME RUMORS AND LIES!” Shanty merely stood in the corner, watching as the scene unfolded between the spy and Lady Minax. “And the Ararat has resurfaced…troubling, but fascinating.” Lord British set the empty wine glass down. “It would seem that all the pieces have been…reset for a new board, and yet all is in disarray and arranged in the wrong places. Enemies surround the Kingdom, and…” Lord British paused, and gave a bit of a frown at hearing a commotion, and King Blackthorn stood and looked out to the courtyard of the castle through one of the windows. “It seems that word travels quickly… and that the people wish to see if this rumor of your return is true. I think we had best indulge them before we have a riot, Cantabrigian.” King Blackthorn turned to lead the way to the throne room.